When people suffer from a mid-life crisis, they do something dramatic like buying a Porsche or indulging in activities they couldn't even manage decades ago (without going breathless). But at 68, Bachchan has safely crossed mid-life, to use it as an excuse for playing this colourful clown on the big screen. And while millions of Bachchan admirers would want to remember him for his iconic roles, 'Bbuddah Hoga Terra Baap' (BHTB) would only stick out like a sore thumb in his resume. BHTB is about a veteran gangster, Viju (Amitabh Bachchan) who has returned to Mumbai from Paris, dressed in what can safely be called as rejects from the fall-winter collection of 1950s. He's cocky, flirtatious and blasts anyone who calls him, well, 'Bbuddah'. His usual response to being called to the 'B' word is hurling the same word back at the abuser's father. This much you get from the title, right? Now, no angry old man is worth his yellow sunglasses and pink pants if he doesn't have a goon to beat up. So, we have the eternally pissed off Kabir (Prakash Raj) and his bevy of assorted henchmen with varied South-Indian accents. Kabir's solo mission in life is to kill the ACP and he conveys this over many phone calls to a random aide, Shahwar Ali, who hasn't showered or shaved for this role. The ACP in question is Karan (Sonu Sood) who constantly hops between hamming cop and pathetically cheesy romantic lines without any warning. His love interest is Tanya (Sonal Chauhan) who can't figure out a strong reason to be in the frame, apart from playing hard to get. In most scenes, she's aimlessly drifting about with Amrita (Charmy Kaur) who's charmed by Viju, so we've come a full circle. But Viju plays the title role, so he was once married to Sita (Hema Malini) and Amrita's giggly and retarded mum, Kamini (Raveena Tandon) is also head over heels for the senior citizen inside the leather jacket. And just cause Viju shares Amrita's love for 'baigan bharta', she wonders more than the script writer did while drafting this sappy mess. Now, director Puri Jagannadh may be a rockstar in Telegu films and his intentions to felicitate the original 'angry young man' of Bollywood may be sincere. But forcing AB to deliver his legendary dialogues with the same zest and charisma seems like something an ardent fan would do on bumping into Bachchan by chance. Why he must wear those hideous clothes and shades while doing so, defies reason. 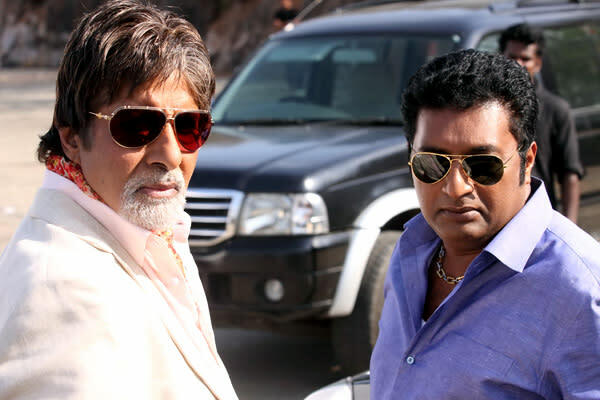 Bachchan is often described in the film as 'Iski umar aur iski baatein match nahin karti'. But with Big B donning a flowery scarf and a Hawaiian shirt, is that really the primary concern?